There’s nothing scary about opening up this Pandora’s Box! Do so any you might well just net yourself the whopping 120,00 coin jackpot that’s available. Miss out on that and there’s still big wins available from the free spins and 4x wild multiplier. 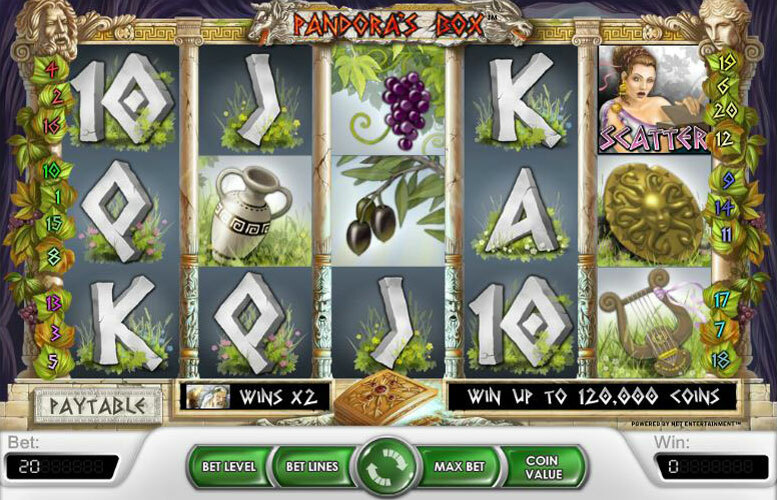 If you enjoy Greek Mythology then you will enjoy the theme of this 5 reel 20 line slot. 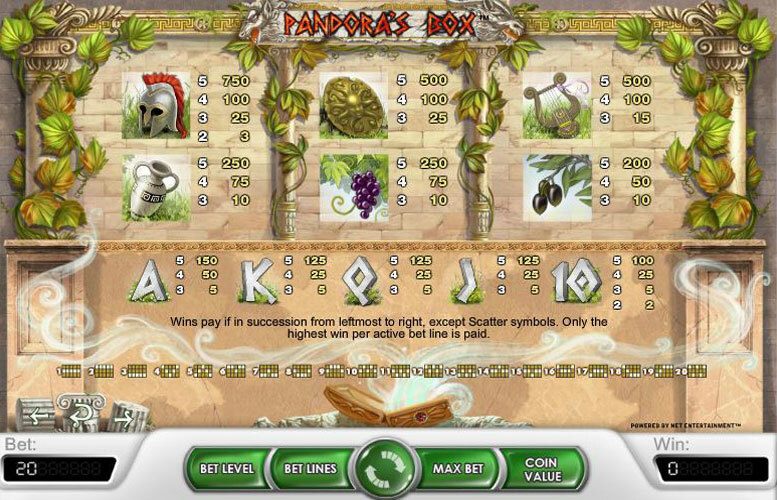 Pandora herself is the star of this game and according to legend she was the first female to be found on earth. She was said to possess many gifts and it would seem that she is ready to display her generosity throughout this slot machine. However it is really Zeus that you want to pay attention to here if it’s the jackpot that you are after. The graphics are very crisp and the reels are not over loaded with color which creates a nice calming atmosphere to the game. There is no soundtrack to speak of although there is a strange sound as if you can hear the Gods roaming the earth in the background. When Pandora appears you will hear what sounds like a quick strum on the harp. You will see some animation when the Pandora scatter appears as well as when Zeus shows himself. The top 120,000 coin jackpot can only be won by betting the max during free spin rounds where you can re-trigger more free spins and multiply your winnings. 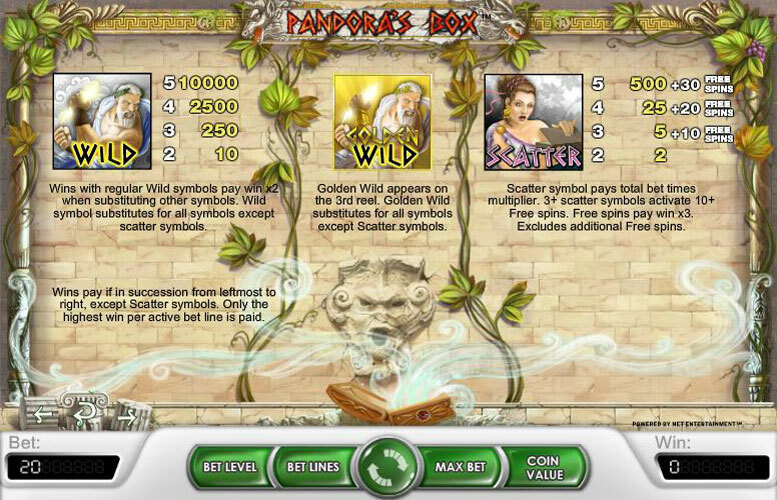 The base jackpot on Pandora’s Box is 10,000 coins and this can be won by collecting 5 of the Greek god wilds. Collecting four of these will pay out 2500, a collection of 3 will award 250 and 2 will allot the winner 10. The wild is the Greek god Zeus with the wild logo on it. He will substitute any of the other symbols to create a winning combination. This icon will double the winning combination that he participates in. There is a second wild multiplier that is special. This is the gold Greek god Zeus with the golden wild logo on it. This symbol will only appear on reel 3. This is a special wild because he will multiply the winning combination that he assists in making up by 4x. The scatter is Pandora and can appear anywhere in the reels. If 2 or more show, then she can complete a winning combination. If three or more show she will trigger the free spin round. Once you have at least 3 Pandora icons showing you will have activated the spin round. You can win 10,20 or 30 free spins. The free spin feature can be reactivated during the free spin play as well. There is no max. on the number of free spins that you can win in this manner. Winds are tripled while in the free spin mode. The helmet pays out 750 for 5,100 for 4, 25 for 3 and 3 for 2. The shield pays out 500 for 5, 100 for 4 and 25 for 3. The harp pays out 500 for 5, 100 for 4 and 15 for 3. The urn pays out 250 for 5, 75 for 4 and 10 for 3. The grapes pay out 250 for 5, 75 for 4 and 10 for 3. The figs pay out 200 for 5, 50 for 4 and 10 for 3. The ace pays 150 for 5, 50 for 4 and 5 for 3. The king, queen and jack in their respective groups will pay 125 for 5, 25 for 4 and 5 for 3. The ten will pay 100 for 5, 25 for 4, 5 for 3 and 2 for 2. You can wager from 0.01 up to 1.00 per pay line. There are 4 bet levels that can be played in this slot. The bet range is anywhere from 1 to 20 bet lines. The max bet is realized by playing the 20 bet lines, at the highest bet level with highest coin value which adds up to 80 coins per spin. This game has a rating of 3 / 5 with 458 total reviews by the users.